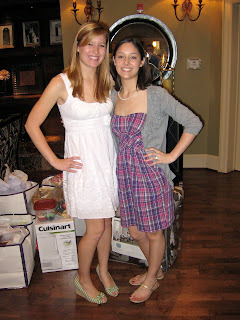 Last Saturday I hosted a bridal shower for the first time! I'm the maid (matron?) 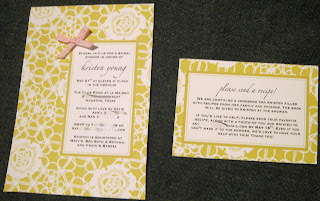 of honor in my best friend Kristen's wedding in June, and I was so honored to be able to throw her a bridal shower (with the help of two of the other bridesmaids)! 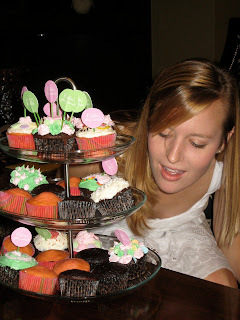 I had SUCH a blast planning the shower (and using all of my serving dishes! 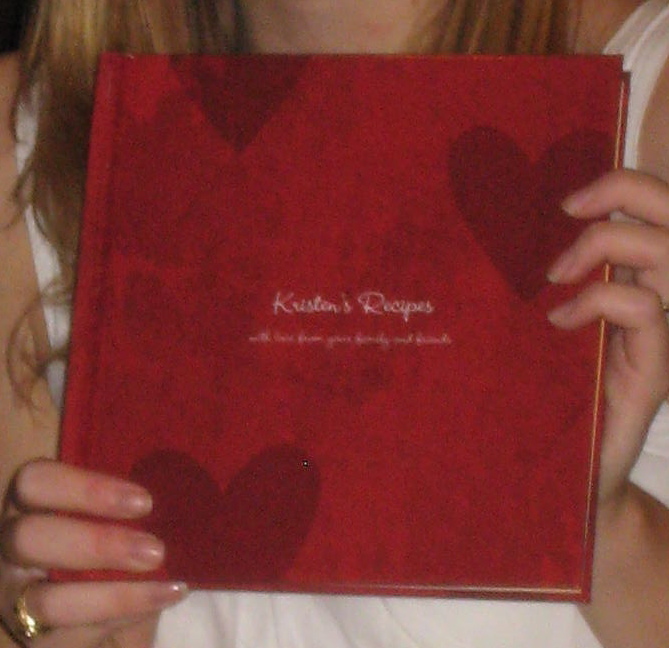 ), and I was SO happy to be able to do it all for Kristen. 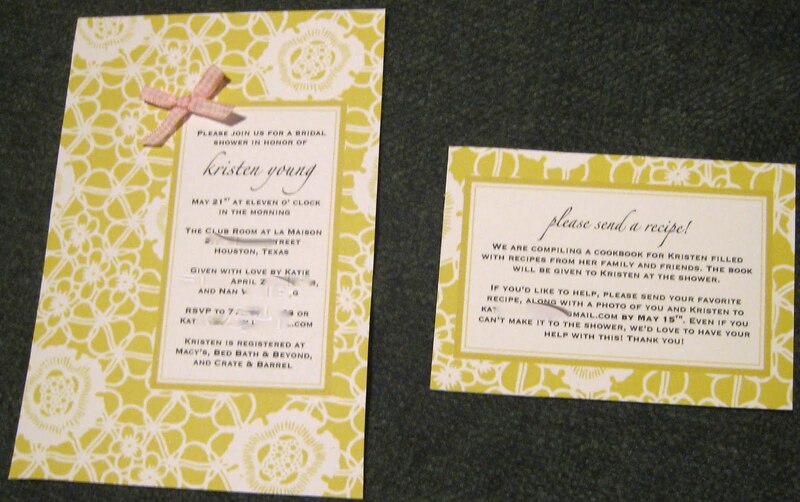 First up - the invitations! I downloaded these from Download and Print (a GREAT free invitation resource, by the way! 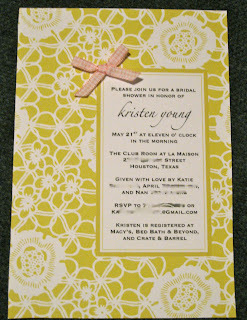 ), added in the text, and printed them on Paper Source cardstock (did I mention that we FINALLY got a Paper Source in Houston? Because we did, and it's wonderful!). I added little pink ribbon bows and mailed them in pink Paper Source envelopes. 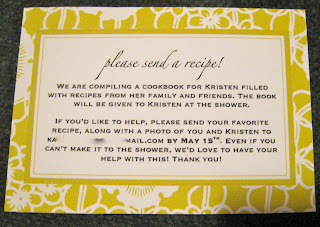 This recipe card went into each invitation to ask the guests to contribute a recipe and photo to a cookbook for Kristen. Next up, plates! 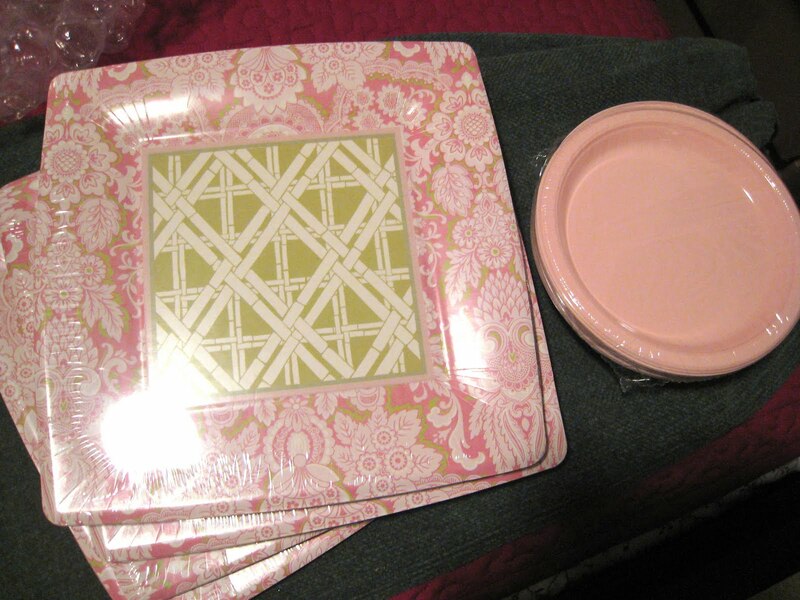 I found these adorable pink and green plates at Tuesday Morning, and I snapped them up for the shower! 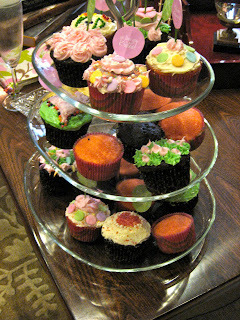 I also bought the little pink ones for dessert. I get really excited about little personal touches, so I created these little "we love you Kristen" tags, along with some matching ones in green that said "Kristen's getting married!" 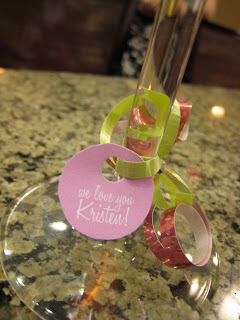 I attached them to the base of all of my champagne glasses with curling ribbon in green and pink. We had the shower in the fancy party room at my apartment complex. It was a perfect size for what we needed, it has a pretty kitchen area, and it was SUPER convenient to not worry about cleaning my apartment after all the cooking and prep work. We decorated it with pink and green crepe paper streamers. We wrapped the green silverware in green napkins with pink curling ribbon. 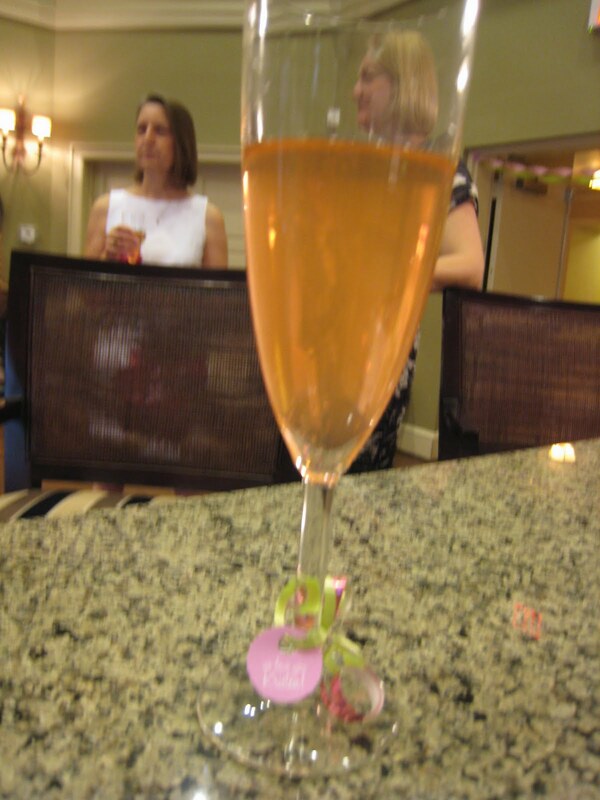 My favorite thing about the shower was this Mimosa Buffet! I set out champagne flutes, three kinds of juice, and champagne, and everyone mixed their own mimosas! The sign on the wall says "Mimosa Buffet - choose your favorite juice and mix up a mimosa!" I just mixed one for each guest as they arrived and then told them to help themselves to refills, and it worked out great! Everyone was trying different juices and talking about which one was their favorite. Haha! We also set out sweet tea and water with plastic cups and ice. Turkey Pesto Sliders - I'll post the recipe for these soon... they were delicious! Funfetti cookies! 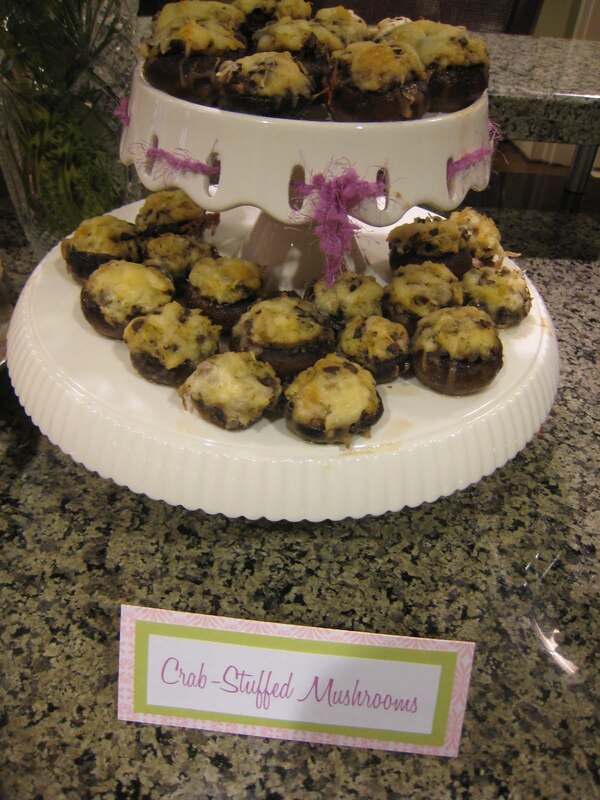 These are one of Kristen's favorite foods, so of course we had to serve them at the shower! We had a "Decorate Your Own Cupcake" station with un-iced cupcakes and plenty of decorating supplies. 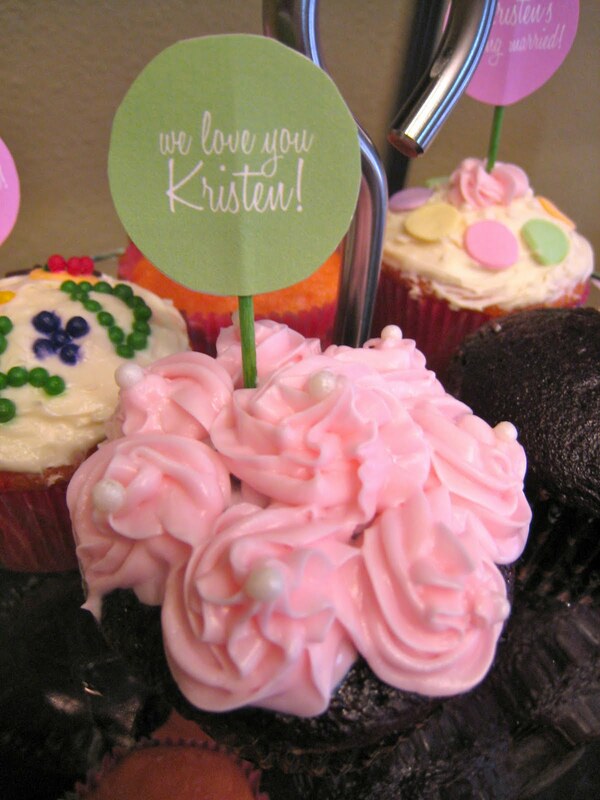 Each guest decorated a cupcake, and then Kristen picked her favorite (and the winner got a little Bath & Body Works prize!). "Pick a cupcake and decorate it! 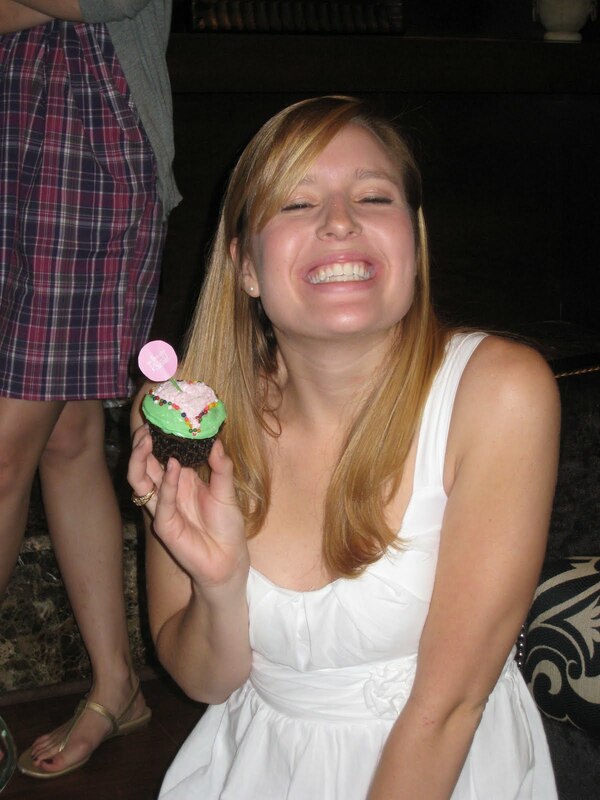 Kristen will pick her favorite cupcake, and the winner gets a prize!" I made little cupcake picks to match the champagne flute tags. 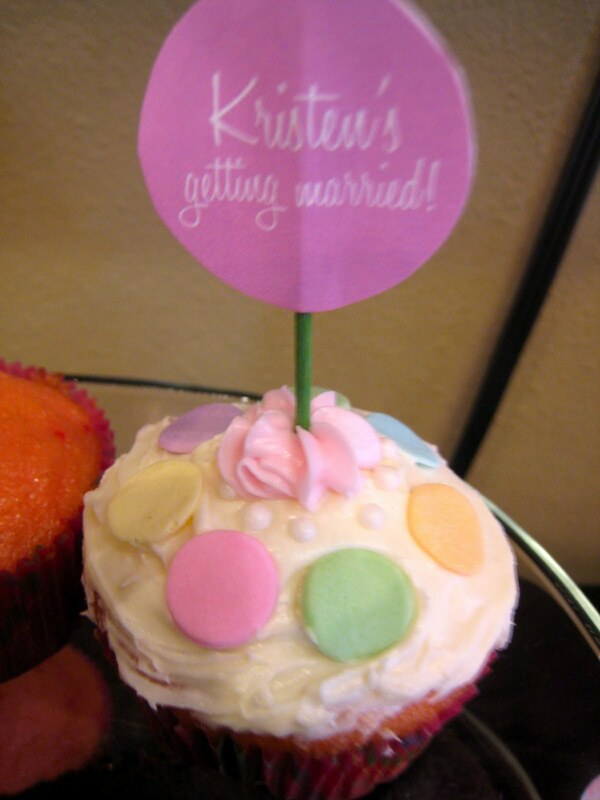 They all said "Kristen's getting married!" or "We love you Kristen!" Here are some of the creative cupakes! After everyone had something to eat and decorated a cupcake, it was time for presents! 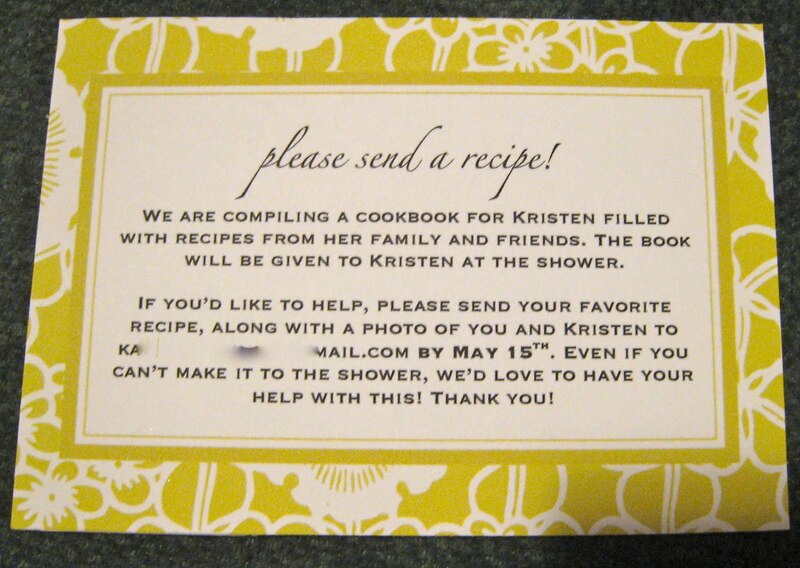 I had each person send me a recipe and a photo (one of them with Kristen if possible), and then I made a page or two for each recipe. 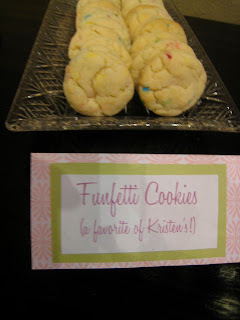 Some people told me a little bit about their recipes (such as "I make this every Christmas" or "Kristen enjoyed these cookies at my house on many Friday nights in high school"), so I included that information in little quotes. 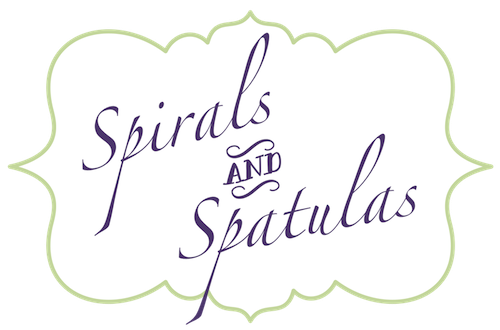 I titled each recipe with a name (like "Sara Johnson's Pasta Salad"). 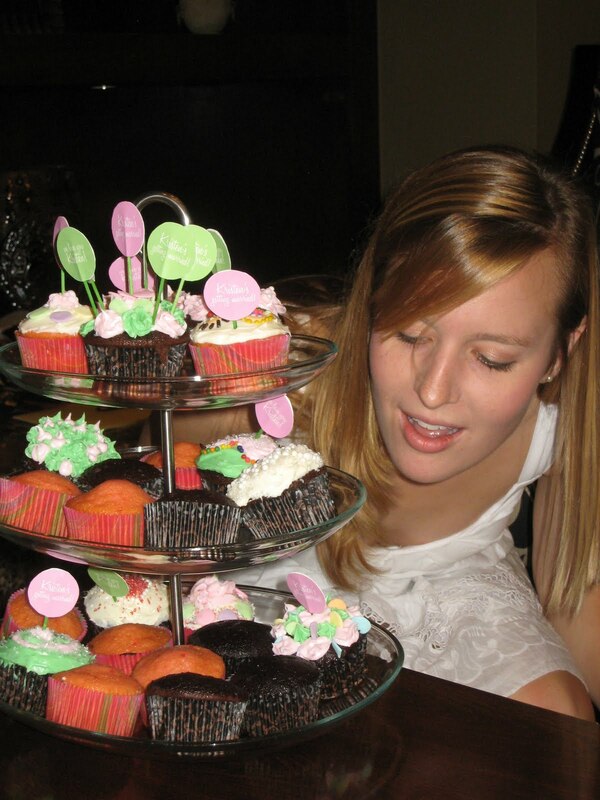 with love from your family and friends"
Kristen had a hard time picking her favorite cupcake, but she did! 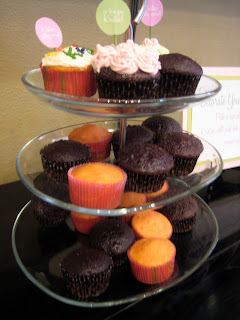 We passed around cupcakes and cookies after that for everyone to eat while we played one last little game. We had asked Dan (Kristen's fiance) to answer some questions before the shower (stuff like "How many pairs of shoes does Kristen have?" and "What's your shoe size?" and "Who kissed who first?"). 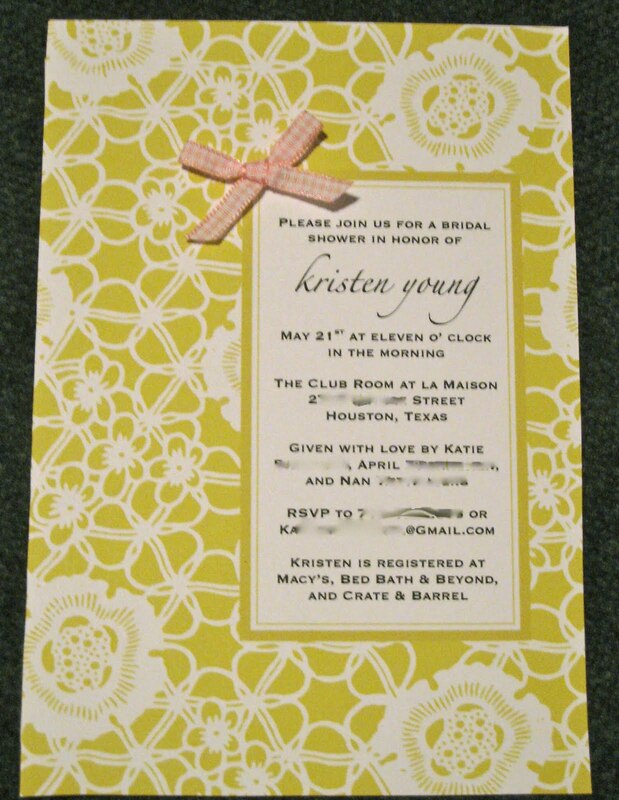 We asked Kristen the same questions and gave her another little gift for each one when she matched Dan's answer. I wish I had photos of this, but we made a posterboard that said "DAN'S ANSWER:" and had all of his answers taped on top of each other (so we could pull each one off as she answered it). One of the other hostesses stood behind Kristen with the posterboard so all the guests could see Dan's answer, but Kristen couldn't (hilarious when Kristen was trying to decide if she had thirty or forty pairs of shoes, and Dan's answer was "8 million!"). 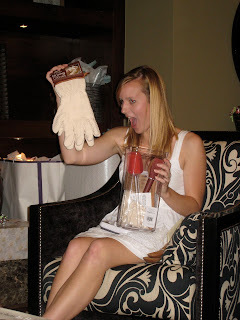 The prize gifts were ten little things from Ikea... cooking utensils, candles, vases, etc. 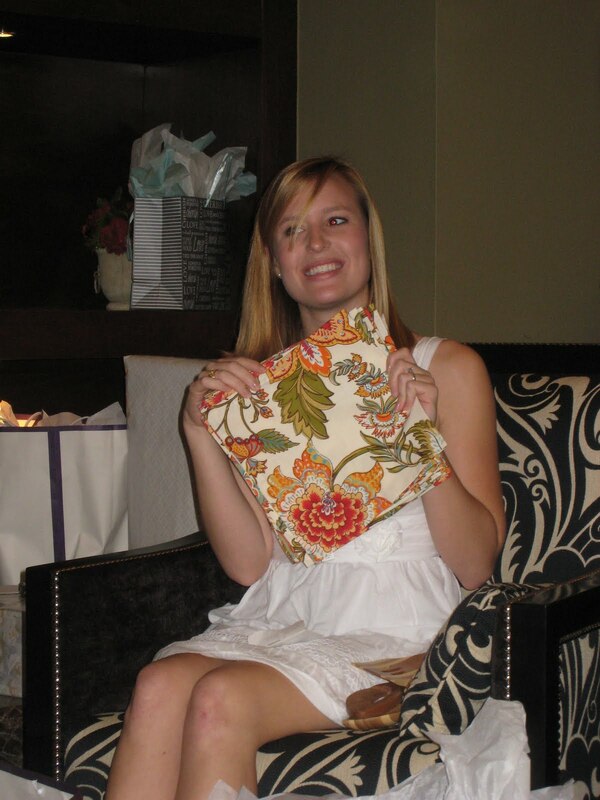 Each time Kristen missed one we just paired that gift with the next one, so she ended up getting them all. 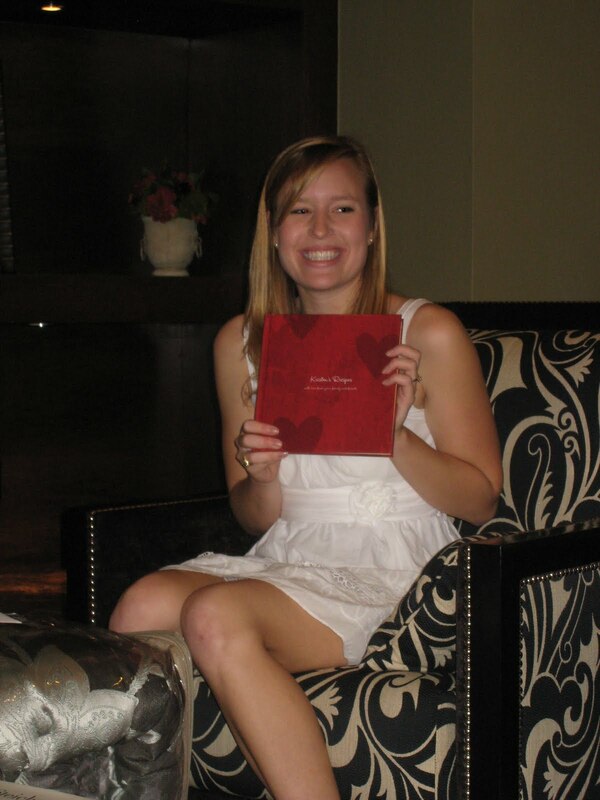 :) We ended with my favorite question, "What was it about Kristen that first caught your attention?" Kristen had no idea what Dan had answered, but there was a big "awww" when everyone found out that he said "her laugh!" Kristen and her shower hostesses! I had so much fun throwing your shower, Kristen! 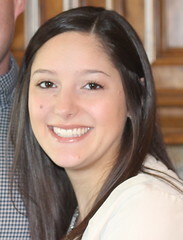 I can't wait for your wedding in just a couple more weeks!! This is all so cute! I wish I could forward this to my bridesmaids to give them some hints but I don't ant to rain on their parade. what a great shower! you did a really great job :) it looks like it turned out really well! This looks like such a great shower! 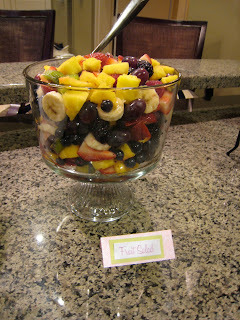 You had such great ideas and everything looked so cute :) I will need to store this ideas for the next time I have to host a shower! 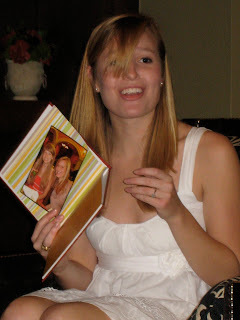 I like the idea of using Shutterfly to print the recipe book. Guestbook Quilt - It's done!! Moving - What to bring first! 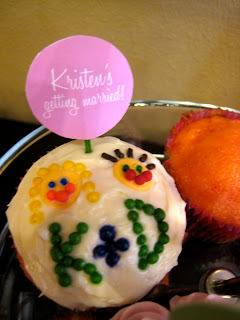 A Couples Shower for Kristen and Dan! Finals Do Weird Things to my Brain.